We manufacture a precision engineered range of Platforms and Base Frames equipment that are used as supportive structures in various industries. Customized as per the specifications of our clients, these are in compliance with various industrial standards. 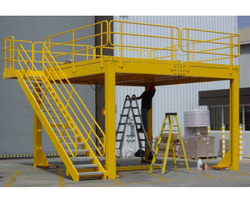 The range of Platforms And Base Frames Equipment available with us is fabricated using the superior quality raw material. These structural fabrications are fabricated using superior quality raw material and are used as a base frame and supportive structures in various industries. Looking for Platforms and Base Frames equipment ?